The proposed affordable housing settlement agreement between Chester Borough and Turkey Farm Acquisitions LLC will be discussed and voted on at the regularly scheduled meeting of the Chester Borough Mayor and Council meeting on Tuesday, October 16 at 7 pm, at 50 North Road. However, the agreement covers much more than just affordable housing. 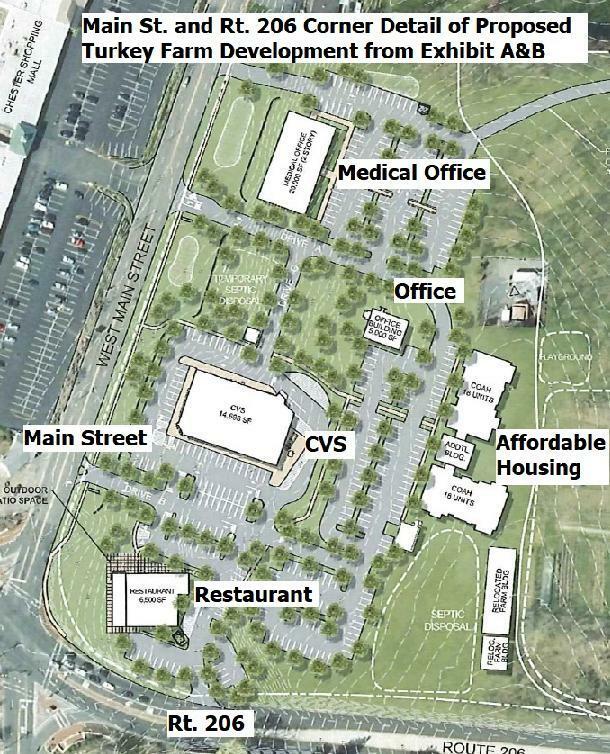 A better description of the development is given below - lots of new commercial development and traffic to be added and the loss of Sunnyside, Larison's Turkey Farm Inn, and a large portion of the Chester Historic District. Because of confidentiality limitations due to ongoing litigation, Facebook or general email will not be answered. If you are planning on email, only emailed comments and questions sent to the development@chesterborough.org mailbox will be answered. In your email, please ask Mayor Hoven and the Council to change the wording in the proposed development plan to require the adaptive resuse of the Larison Turkey Farm Restaurant rather than leave it to the Developer's discretion. · A 14,698 sq ft CVS with a drive through window. · 36 affordable housing units to be built and paid for by the developer. · A 5,000 sq ft office building at the location of Sunnyside. · A 20,000 sq ft medical office building. The Chester Historical Society has been in communication with the Owners. At a meeting about the proposed development, they said they wanted to have a good working relationship with the Historical Society and the Borough. The Society also seeks to have a good relationship. However, significantly more needs to be done for historic preservation at Larison’s corner. The current proposal contravenes Chester Borough’s Master Plan and Historic Preservation Ordinances. As currently presented, the plan would demolish Sunnyside and the Isaac Corwin House (Larison’s Turkey Farm Inn). Both are important Chester historic houses. The Chester Historical Society has advocated for adaptive reuse of historic buildings rather than demolition. More imaginative solutions could result in a win for Chester, a win for the Owners, and a win for history. Let’s keep “Historic Chester” historic. Come to the meeting on October 16, 7 pm to voice your concerns. If you can't make it to the meeting, send an email. In your email please ask Mayor Hoven and the Council to change the proposed development plan to require the adaptive resuse of the Larison Turkey Farm Restaurant rather than leave it to the Developer's discretion. Selected Comments and an update from the SAVE SUNNYSIDE petition effort are in the Nov. 2017 Newsletter. To access, click on "Newsletters" on the left side of this page. Click on pdf symbol below to get the Sunnyside story. The Sunnyside Story and why it should be adaptively reused. Along Main Street in Chester, NJ around 1890. As you read this, try to imagine what life was like over 200 years ago. In the early 1700s, the trails across New Jersey were Indian trails through densely wooded areas, and wide enough only for a man on horseback. It was by these trails that a band of settlers from Southold and Easthampton, Long Island, came to the rolling green hills of Morris County. Two of these trails crossed in the area that the Minisink Indians called �Alamatunk,� which meant �black earth bottom� for Black River. And �Black River� was the original name for Chester. Most long-time �Chester-ites� say that no one knows why the name �Black River� was dropped and �Chester� was adopted. Some of the residents had been calling their community �Chester� for a good while, and it has been noted that it probably was because Chester, England was the home of their ancestors. These English ancestors migrated to New England and then to Southhold and the Hamptons in Long Island; their grandsons came to Black River in New Jersey. The people of Black River must have felt great satisfaction when they received notice from the state that their wish to create their own township was granted! Thus, on January 29th, 1779 the business of running the new Township Of Chester began. Because of the two great roads which intersected in Chester, taverns, inns, blacksmith shops and other travel-related businesses flourished during the latter half of the eighteenth century. Distilleries also did a thriving business in applejack and apple brandy (known as �Jersey Lightening�) produced from apples grown in the many local orchards, a few of which still operate today. Not only were the rolling hills of the area dotted with orchards of peaches and apples, but dairy and sheep farming were very widespread as well. During early settlement, agriculture was a mainstay of the area; however, industrial potential was soon to be realized. Numerous swift-flowing streams provided ideal settings for water-powered grist and saw mills. These streams also served as sources of power for the early charcoal burning forges and furnaces, which were used to work the iron ore taken from local mines. The Civil War brought more demands for iron and the mines began to flourish. During the period from the late 1860s to the late 1880s, Chester had 28 active mines. In 1880 six mines were operating on Main Street alone. Several hundred thousand tons of iron ore were taken from 25 to 30 different mines at this time. In 1868 the Lackawanna Railroad built its branch in Chester, and in 1872-73 tracks were laid to connect it with the Hedges and Hacklebarney mines. These tracks were later purchased by the Central Railroad and carried through to High Bridge. Sometime later, the DL&W Railroad took over the tracks alongside Chester�s �Muskrat� Station that ran to Dover. The Chester iron industry suffered with the mining of much larger and richer iron ore deposits found in Minnesota�s Mesabi Range, and by the 1890s all of the Chester mines were shut down. Residents who could not return to farming soon moved away. Even though Chester died as a mill and mining town, some unusual light industry soon moved in to support the town. Two of these industries were Sturzenegger�s Swiss Embroidery Factory from New York and the Davidson Handkerchief Factory. Also, in the early 1900s Chester became a very popular retreat for city-weary New Yorkers. Local hotels charged reasonable rates and visitors were drawn by the famous springs with their health-giving waters on top of Schooley�s Mountain. Small towns during this time utilized their main streets for almost all of the local businesses, schools, churches and homes. Local taverns were not only stopping-off places for visitors to �wet their whistles,� but they were where much of the news of the area was passed on. Many of these original buildings still remain on Chester�s Main Street and country roads today. A booklet entitled �A Stroll Through The Old Village Of Chester, NJ,� published by the Chester Historical Society, assists those interested in a historic walk or ride through Chester in finding various historical sites. Please refer to this web site's section, "Publications," to learn more about the availability of "A Stroll Through the Old Village of Chester, NJ" and other publications by the Chester Historical Society.